RIM has revealed a new NFC sharing app for BlackBerry handsets at BlackBerry World in Orlando, Fla. According to Pocket-lint, BlackBerry Share enables users with NFC-enabled handsets to share apps with each other by simply tapping the two phones together. 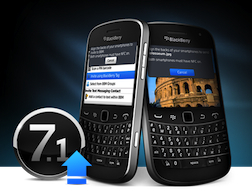 Once a connection has been made, each user will be presented with a list of apps the other user has downloaded from BlackBerry App World. According to Pocket-lint, the Share app will not allow you transfer installed apps between handsets – rather, it provides a simple way for users to check out the contents of each others’ phones and provides a quick link to the app store where they can download it themselves. BlackBerry Share is now available to owners of BlackBerry NFC-enabled devices.